The European Parliament’s Brexit co-ordinator Guy Verhofstadt – he used to be the Belgian PM, don’t you know – doubled down on Donald Tusk’s controversial comments about Brexiteers without a plan by saying this. Brexit-loving Labour MP Kate Hoey wasn’t happy, not happy at all. So unhappy, in fact, that she went on Twitter – where else? – to say this. 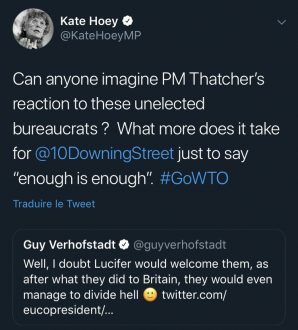 But if Hoey was hoping to have the last word, all she did was set Verhofstadt up for the perfect comeback. And he accepted it with pleasure. Hi @KateHoeyMP, thanks for the feedback. Actually, I was elected by my constituents with over 500k votes. Dear Mr Verhofstadt, you have just made one of elected representatives look very silly and exposed them. Just wait til she finds out there’s no WTO elections. On the other side of the fence was this. Let me explain it for you. The point she is making is that you are part of a machinery that makes laws in the UK without being accountable to the U.K. electorate. You might have 500k of votes in Belgium but that no more makes you elected here than Kate Hoey is in Belgium. If only she’d said that. Or something like it.